First of all, WHY kombucha? Kombucha is a fermented green or black tea using a SCOBY (symbiotic colony of bacteria and yeast). This fermented beverage contains probiotics that support a healthy gastrointestinal tract. It also contains B vitamins and enzymes which help detoxify the body. This bubbly beverages has been used therapeutically for hundreds of years, but we're still waiting on modern research to catch up. Kombucha is not for everyone. Many people gain awesome results from drinking it regularly, and some drink it simply for enjoyment of the flavor. Others may not react to it as well or can't stand it's vinegar-y tang. If you're a kombucha newb, start with a couple ounces a day at first to see how your body reacts. Brewing your own kombucha can be a fun project that allows you to cater to your own taste preferences. Not to mention the $$$ you'll save! There are many variations to brewing kombucha, but I am sharing with you the process I use in this step by step kombucha brewing tutorial. Make sure to read through all the instructions carefully before starting the brewing process to avoid contamination! Black or green tea, preferably organic. Make sure it's pure tea and does not contain any oils (as in earl grey tea) or flavors. If you want a flavored kombucha you can add them in AFTER the brewing process. 1 cup sugar- again, preferably organic. I like organic coconut sugar. The sugar is necessary. It's what the SCOBY feeds on to cause the fermentation. If you're trying to avoid sugar, then allow your kombucha to brew for longer. Longer brew time = lower sugar content. Glass container for brewing. 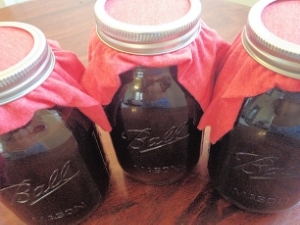 I used a couple of quart sized mason jars which works fabulously. Must be glass! Airtight containers, if you want to make your kombucha carbonated. Mason jars aren't necessarily airtight, so consider purchasing some glass containers that are made for kombucha/beer brewing. I sanitize and reuse kombucha bottles that I've bought from the grocery store. SCOBY: If you know someone who brews (ahem, yours truly) you can ask them to save you a layer of their SCOBY. (The SCOBY creates new layers every time you brew a batch that otherwise have to be thrown away or stored.) You can also purchase them online. I bought mine for about $7 on Amazon. A sample of already brewed kombucha as a starter. If you buy your SCOBY online, it should already have a little bit of this liquid included with it. Notes on your SCOBY: Your SCOBY is very much a princess; high maintenance and particular about its conditions. It doesn't like to mingle with other bacteria, nor does it like hot temperatures, metal, plastic, or bright light. Be sure to sanitize everything that comes in contact with your cultures and store in glass containers. 1. Sanitize all the utensils you are planning to use. Some soaps have scents or oils that linger even after washing, so boiling hot water is the best sanitizer in this case. Also make sure to wash your hands thoroughly with anti-bacterial unscented soap before handling your beloved SCOBY. 2. Brew some sweet tea. Bring 3 quarts of filtered water to a rolling boil on your stove. Let it boil for a couple minutes to make sure any bacteria is killed. Turn heat off, and add about 5 tea bags. Allow tea to brew for 3-5 minutes (less time for green, more for black). Remove tea bags and add 1 cup sugar. Make sure the sugar dissolves completely. 3.Wait. Remember that whole thing about SCOBY not liking the heat? If you add it now it won't survive. Give the tea a few hours to cool down to room temperature. 4. Add your SCOBY. Once your tea is at room temp, transfer it to your glass container. Add your SCOBY and the kombucha liquid. Cover your container with a clean cheesecloth or other cloth to keep out bugs and other foreign substances. It does need to air out a bit, so no need for a lid just yet. 5. Wait again. Store your containers in a warm, dark place. The warmer the temperature, the faster it will ferment. After about a week, you can start tasting your kombucha every couple days until it reaches the desired flavor. When you taste your tea, remember not to let it come in contact with anything that could contaminate it! This includes your mouth, so don't drink directly from your brewing jar. Also remember that the longer you let it brew, the less sugar it will contain and therefore have a stronger acidic taste. 1. Remove SCOBY: Once your brew reaches your desired flavor, carefully remove the SCOBY and some of the liquid and store in a sanitized and covered glass jar or bowl. Notice that now you have multiple layers on your SCOBY, a "baby" and a "mother" culture. If you choose to brew again, remove either of the layers and use it for the next batch. I prefer to keep the "baby" and toss the "mother" to keep it as fresh as possible. 2. Carbonate: Transfer your brew into your airtight storage containers. If you want to add flavors, this is the time to do it! Some suggestions are fresh fruit, ginger, or herbal teas. Fasten the lid on loosely to avoid too much pressure build up, and allow to sit at room temp for 3-5 more days. It is during this period that your kombucha will carbonate. It also might be wise to let some of the pressure out every few days by unscrewing the caps and then putting them back on. If you don't want it bubbly, skip this step and store in the refrigerator. 3. Chill: When the process is complete and your kombucha has reached your desired flavor and bubbly-ness, it is ready to enjoy. Store it in the fridge. If you don't keep it cold, it will continue to ferment! If there is fruit or other flavors added, you can either keep them in, or strain them out at this point. 4. Repeat: You have everything you need to keep the brew cycle going. Make some more of that sweet tea and use your baby SCOBY and kombucha liquid to brew the next batch. Don't forget to sanitize! If you choose not to brew another batch right away, there are several methods of storing it safely until you use it again. Want some more info on live cultures and fermentation? I have found the Cultures for Health site to be very helpful on the topic.